“Point Counter Point,” which opened on March 3, comprises works of art that specifically play with and respond to the exhibition space, which first opened some 20 years ago. “If the exhibition space has been the means to back up works of art it houses -- which is also the case in many other exhibitions -- this exhibition is more space-centric,” said Kim Hae-ju, Art Sonje deputy director. “We designed the exhibition space itself to stand out more,” Kim added. For the exhibition, Art Sonje has invited artists who have been active in interpreting space, including Kim Min-ae, Oh Jong, Kim Dong-hee, Lee Soo-sung and Choi Go-eun. “Art Sonje’s space has been a somewhat difficult place for artists to display their works due to its quarter-circle shape. We thought it could be easier for both the artists and the center to speak more strongly if we chose the space itself as art material. In a way, it’s also a special thank you to the space,” Kim Hae-ju said. For the project, the artists have used the space and architectural components of the quarter-circle-shaped floors as their subject materials. As alluded to in the title “Point Counter Point,” each artist presents his or her works in response to the space, as well as to the other works in the space -- like the musical term “counterpoint.” Each work of art is interdependent and independent at the same time. 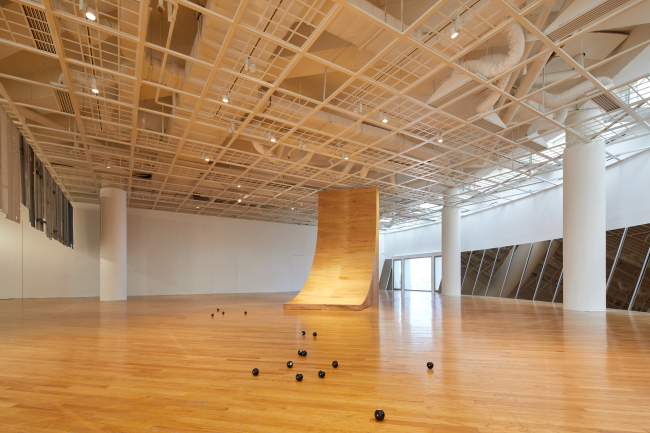 “In previous exhibitions, I presented works that actively responded to their exhibition spaces. But this time, I wanted to do something that responds to the space in the simplest manner. 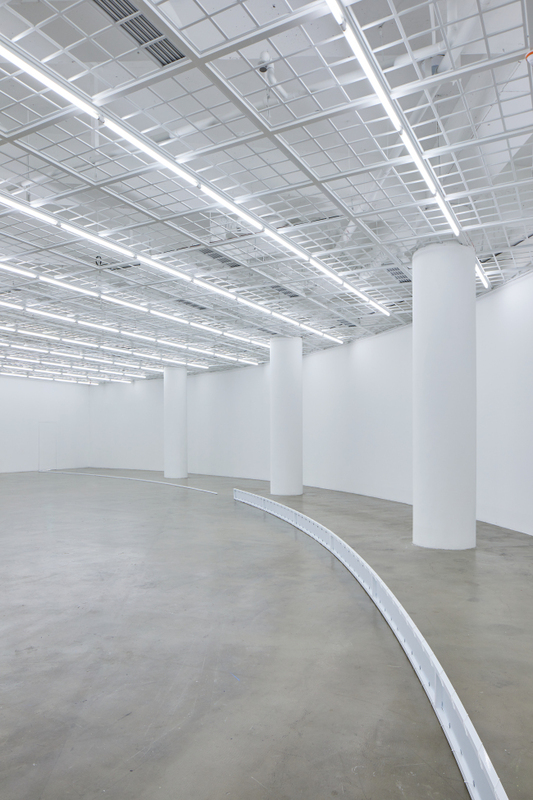 I wanted the work’s relation to the space to be an immediate one but functionless,” Kim Min-ae added. 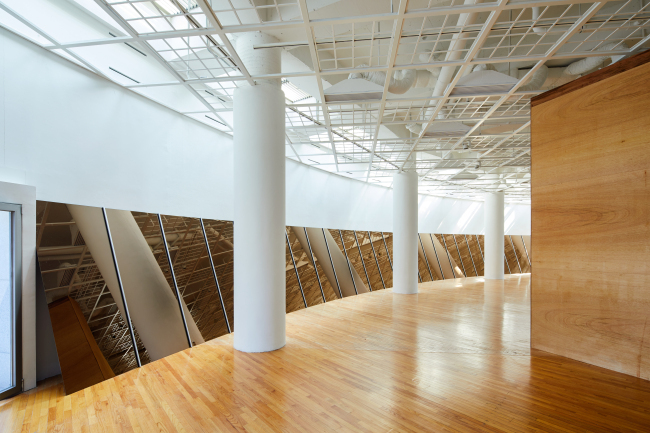 Kim Min-ae’s work “Vanishing Line,” is an installation piece that stretches alongside the curved wall of the gallery‘s second floor. The minimal structure reflects the curved space yet just lies there as if resisting creating multiple layers of meaning. On the other side of the second floor, Oh Jong’s “Room Drawing” uses materials such as metal rods, thread, thin chains and Plexiglas to create lines that divide and reconstitute the space. As viewers walk along the installation, they experience different shapes of space partitioned by the lines. “An installation is a work that invites physical experience, instead of contemplation. I try to make works that evoke immediate physical responses from the spectators. I intentionally attempted to prevent meanings from being associated with my works. In the past I tried to tell my stories through works, but it felt wrong,” said Oh. Other works included in the project are Lee Soo-sung’s quarter pipe sculpture “Untitled,” Choi Go-eun’s “White Home Wall” -- a hanging installation made up of sliced sections of discolored home appliances -- and Kim Dong-hee’s “Volume: Type 1, 2” installation that plays with lights coming into the galleries. Special acoustic performances will be held at the exhibition halls on Saturday and April 7. The “Point Counter Point” exhibition runs through April 8.